The Baselift 6300HA and 6310HA are electric rise and fall worktop lifts by renowned Swedish manufacturer Granberg. Either wall or floor mounted, they create a height adjustable access solution to cater for both standing and seated users. Their innovative compartment frame design allows for the installation of facia fronts and accessories. The 6300HA and 6310HA series are particularly suited for kitchen sinks and drawers due to their increased frame height. Each worktop lift is custom made to the exact size you require, and comes with a choice of push button or remote control. They also include an integrated safety stop strip which prevents the downward motion of the lift in the event of an obstruction. 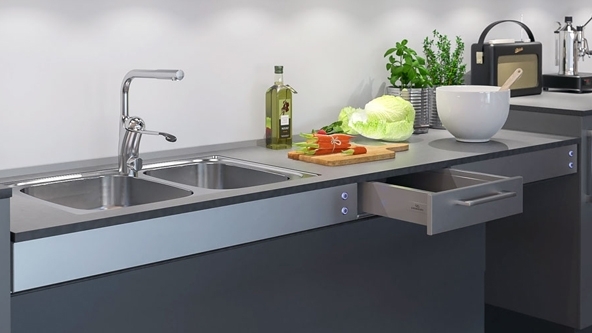 The Plusmodules are used to extend the worktop lifts beyond their normal length. They offer all the same benefits of the lifts in terms of compartment frame design, allowing you to mount facias and accessories as desired. The Plusmodules are also useful for space planning, as the legs of the lift can be positioned in such a way to avoid wall obstructions.